Legendary Queen's football coach Doug Hargreaves – whose great spirit and dedication led Queen's athletes to huge successes both on the field and off – died Tuesday, July 5 after a cancer diagnosis last year. "I am deeply saddened to hear of Doug's passing, and on behalf of the entire university, I would like to express my sincere condolences to all of his family and friends," says Principal Daniel Woolf. "Doug was a very special part of campus and Kingston life for many years, influencing hundreds if not thousands during his lengthy tenure as coach of the Gaels. His presence will live on in the memories and experiences he shared with so many." Hargreaves, dubbed by the press as "one of the winningest coaches in Canadian college history," led the Gaels for 19 years, from 1976 to 1994, nabbing many titles, championships and awards along the way. Under his watch, the Gaels won the Vanier Cup twice (1978, 1992) and claimed eight conference titles (two Yates Cups, six Dunsmore Cups). Overall, Hargreaves finished with a 110-59-3 (wins-losses-ties) record. His 1978 national championship team finished with a perfect 10-0 undefeated season and playoffs. In 1983, Hargreaves was recognized as Canadian Interuniversity Sport (CIS) Coach of the Year, receiving the Frank Tindall Trophy. With Hargreaves as leader, the Gaels earned 16 consecutive playoff berths. Without a doubt, great games and championship wins were important to Hargreaves and Queen's. He was enthusiastic and passionately competitive. But, as noted during many award ceremonies, his success as a longtime coach was built on more than that. He not only instilled athletic abilities into his players, but also the life skills they needed to create and build inspired and successful careers and lives – something he enjoyed seeing in his athletes as he watched them move on from Queen's. "Most significantly, he has been a builder of Queen's through the building of young men's character, skills and academic abilities," reads the citation for the Queen's Distinguished Service Award, which Hargreaves won in 1995. "Despite the pressures and pleasures of winning, he has always set a higher value on the quality of play and integrity of the players. To his teams and co-workers alike, he has been a source of optimism, encouragement and positive energy, a man of uncommon modesty, respectful of every person and respected in turn." Growing up in Sault Ste. Marie, Ont., Hargreaves was influenced by his own father's athleticism and positive nature, as noted in a Sault Star article in 2012, when he received an honorary doctorate from Queen's. Young Doug went on to be a top athlete, playing basketball and football and deeply impacted by Sault Collegiate coach Tom Tipton. Hargreaves's own coaching career began at Sault Collegiate, and then after several years in the Royal Canadian Air Force, he became assistant athletic director and football coach at the Royal Military College. In 1972, he moved to Dalhousie University as athletic director and football coach, before making his way to the head coach position at Queen's in 1976, taking over from Frank Tindall. Hargreaves was instrumental in forming the Gaels Football Club and was the catalyst behind the Alumni Football Hall of Fame. He was inducted into the Queen's Football Hall of Fame in 1995, the year after he retired, and in 2003, he was inducted into the Kingston Sports Hall of Fame. In addition to the Queen's Distinguished Service Award, Hargreaves also won the John Orr Award, (1997) and the Jim Bennett Achievement Award. 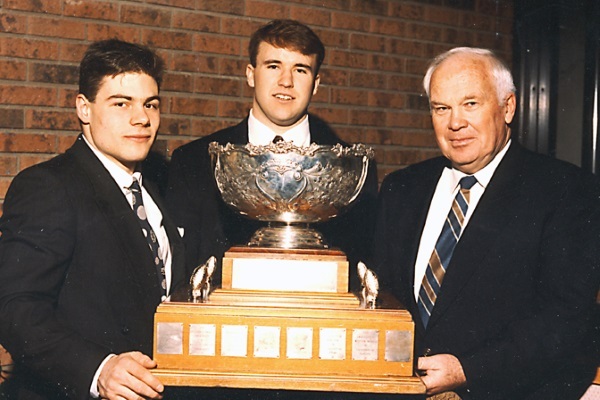 Each year at Queen's, the Doug Hargreaves Award is given to the Most Outstanding Offensive Football Player in his honour. A Celebration of Life will be held at the Senior Staff Mess, Royal Military College, on Sunday, July 10, 2-5 pm. The family suggests that memorial contributions be sent to Hospice Kingston or to the charity of your choice. More information is available from James Reid Funeral Home.